One hand wrapped cotton fiber rainbow in pastel pink, peach, gold, mint green, light blue, and purple. Each piece will be slightly unique, as it is made by hand. Approximately 10”w x 7” and ready to hang from an ribbon attached to the back. Made to order, ships in 3-5 business days. 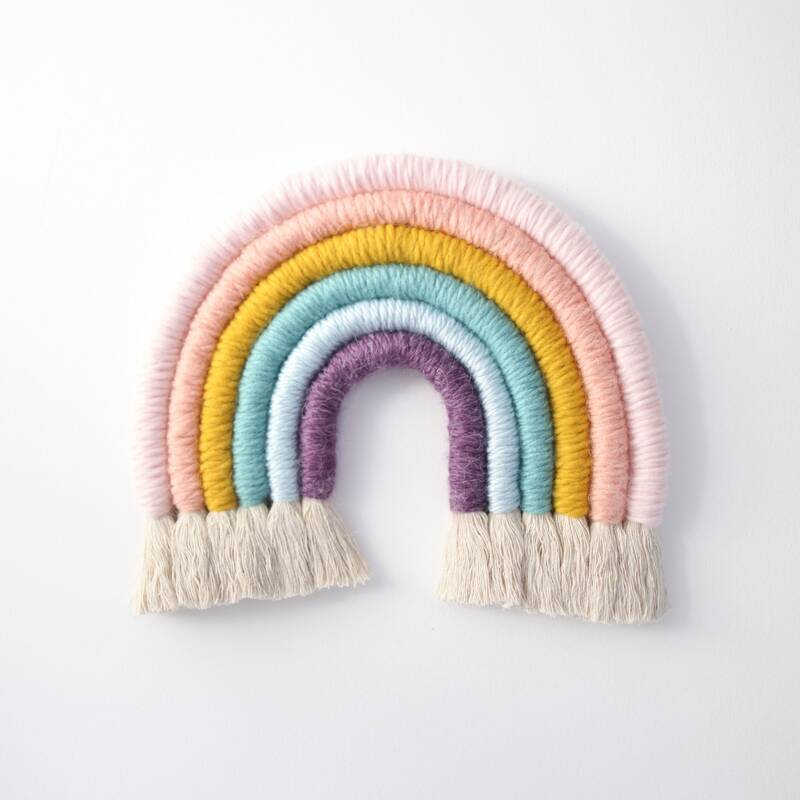 Fiber Rainbow Wall Hanging "Sweet Pastels"
Beautiful! So well made - it will be cherished for years to come! This is gorgeous and well-made. Colors are just as depicted on screen. So cute! Just lovely! This piece adds a perfect touch of cheer and sunshine to my studio space. Rainbow with Pom Pom trim "Color Baby Color"
Any item can be returned within 14 days, shipping at buyers expense. Please ask any specific questions you may have regards to size, color or material before purchasing so that I can help prevent a return if possible. I will ship in stock orders within 1-2 business days of when an order is placed. If you need expedited shipping, please let me know. All domestic shipments are shipped USPS priority mail and will include item tracking. Patches ship First Class domestically. For international orders: You are responsible for import fees, taxes, VATS or any other custom fees should your package be processed by customs. If you are interested in custom size/ colors, please fell free to contact me! All made to order items will have unique variations from the items pictured, as they are made by hand by me. Subtle differences in color, texture and size may be present. Computer and phone displays may distort color. If you have any questions or concerns, please contact me. Fiber Rainbow Wall Hanging "Vibrant Gradient"